In the beautiful green north-west of Friesland (a province in the north of Holland), near a farm just outside the village Welsrijp you find the idle place for a beautiful holiday . From the quiet lain bungalow or caravan you can explore Friesland. Friesland the green province of the Netherlands. The new-born Klaske 2 and her mother. On our Milkcattle-farm is a lot to do of course there is milking on a daily bases. 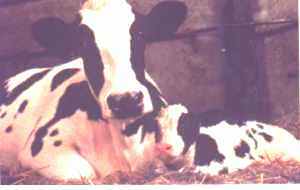 and frequently little calf's are born. Beside the 60 cows and many little Calf's there some dwarf ewes, (perhaps with sucking lambs) chickens and rabbits. of course there are tractors and machines too. *Welsrijp leis 5 kilometre from Franeker. 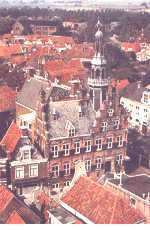 Franeker is an old historical little town. In the time of Napoleon it even had an University. A lot of old buildings still remind to that time. *Also Franeker is well-known by the Planetarium.. Eise Eisinga built between 1774 and 1781 a copy of the solar system on scale on the sealing of the livingroom in his house. On this solar system you can still read (now 200 years after Eisinga built it) the exact position of the planets on this moment. The Slachtedyk is an old friesian dyke which kept the water out in the past. The dyke which lies nearby our village has become well-known in the year 2000 during the Simmer2000 event when the Slachte-marathon was organised. A Marathon on top of this dike. During SIMMER 2000. a lot of Frisian from around the complete world came back to their birth layer. 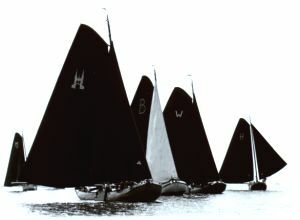 Skutjesilen is a Friesian word for a raceing compatision between old cargo Sailing ships. (the skûtsjes ) Each summer the skûtsjes are keeping friesland in their spell. Everyone who feels something for sailing, keeps track of the fight between the old cargo liners. For a beautiful rite on a horse you can go to the large riding school of the neighbours.